Just sent a PM requesting the latest version. I guess I should update it to mean v4 and v6, now that Iâ€™m caught up on the discussion. The audio volume seems a bit low, and in some scenes lower still. Iâ€™m having to turn up my volume higher than normal just to try to keep up. When it goes to Kylo Ren entering Snokeâ€™s throne room at around 14 minutes in, Snoke references having the Resistance â€˜on a stringâ€™ to General Hux, even though I believe Hux no longer speaks of it first? Maybe drop/edit out the audio of Snoke making that reference? Where Luke rescues Leia (neat edit! ), Iâ€™d replace the music thatâ€™s been inserted with something that is less loud/intense. Maybe something from Return of the Jedi involving Luke & Leiaâ€™s co-theme? https://www.youtube.com/watch?v=9HXwju2UXio The song is pretty quiet at first, but thereâ€™s a louder/grander part about 3 minutes in that may work better. At about 38 minutes in, during the first lesson, Rey still talks about sensing nothing from Luke, and that heâ€™s closed himself off from the force, but in this edit weâ€™ve already seen him using the force to sense and rescue Leia. Probably needs to be cut? Maybe go from Lukeâ€™s lamenting how she didnâ€™t even try to resist the dark side, to the â€˜Iâ€™ve seen this raw strength only once beforeâ€™ part? I like the re-insertion of the â€˜third lessonâ€™ with Rey rushing off to â€˜saveâ€™ the caretakers, however for my taste I would edit out the beat with them encouraging her to waive the lightsaber in the air; I think thatâ€™s a bit too silly, especially for an edit of the movie that takes out scenes like the opening Hux/Poe gag. At the end of that same scene, after Rey leaves Luke in frustration, this is nitpicky but it felt a little unnecessarily awkward/jarring the way it cuts with a screen wipe to the scene of Rey connecting again with Kylo Ren. Speaking of that scene, maybe cut out the â€˜could you put a shirt on?â€™ joke? This one may be very nitpicky, but if one of the goals is to make Hux seem less foolish, at 1:23:30, maybe cut out where he literally parrots Kylo Ren saying, â€œAll firepower on the speedersâ€�? I see that Finnâ€™s potential â€˜sacrificeâ€™ scene is cut. Iâ€™m not sure I agree with losing it entirely, but I understand cutting the â€˜I saved you, Dummyâ€™ bit as well as the â€˜This is how weâ€™re going to winâ€™ stuff, including the awkward kiss. Maybe it could work to leave in his near-sacrifice, Rose saving him, but losing the follow-up and just picking back up with them when Finn drags her back inside? Speaking of unnecessary parroting, at about 1:24:40, (I forget her character name) Carrie Fisherâ€™s daughter is saying that no one has responded to their signal, and then the other lady restates the exact same thing a second later. Maybe cut the other lady who essentially repeats the same line? Actually, I paused the movie right at that point, and now upon resuming I see thereâ€™s no cut before the camera pans over to Leia. That might make removing it difficult-to-impossible. The part where Luke is revealed to have survived the walker blasts, specifically where Luke mimes brushing dirt off of his shoulderâ€¦ am I the only one who feels this is more of a â€˜Mark Hamillâ€™ move, rather than something Luke Skywalker would do? If soâ€¦ maybe it should go? Back on the â€˜Save Huxâ€™s dignityâ€™ front, maybe cut out the bit with him saying to not get distracted, followed by Kylo Ren slamming him into the wall? Iâ€™d say, ultimately, Lukeâ€™s death should be put back in. We may not like that heâ€™s gone, but it is what it is, and Episode 9 will clearly indicate as much, presumably with him appearing in either flashbacks and/or as a force ghost. Maybe I missed it, but did this edit cut the shot that reveals that Rey still has the Jedi texts? If thereâ€™s a way to keep that, I think it should stay in. The ending feels a little weird without the kids on Canto Bight, but at the same time I understand why itâ€™s cut since the rest of that subplot is gone. Overall, while it obviously suffers a little bit from being re-edited like this (which inevitably can make it feel a little rough in spots and can make the pacing feel â€˜offâ€™, including the ending), I have to say that I donâ€™t miss the Finn/Rose sub-plot on Canto Bight at all, however I slightly miss the final Canto Bight scene with the boy revealed to have force powers. Itâ€™s too bad that itâ€™s impossible to replace that sub-plot with a new, improved one. 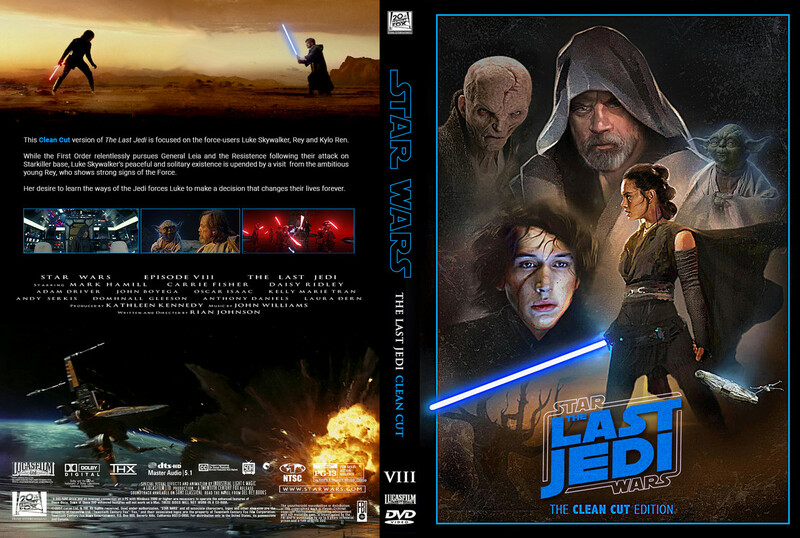 Once you settle on a final version or two (I would hope for at least one final version being one that only uses TLJ/TFA scenes), it would be great to get a 1080p or even a 4K version of this eventually! Cut Rey force-grabbing Kyloâ€™s saber in the Snoke confrontation, only to have it taken away from her a second later. BIG CHANGE. Snokeâ€™s guards now have lightsabers. Some may not like this change but I have my reasons and iâ€™ll explain. Every Star Wars movie has a lightsaber duelâ€¦ except The Last Jedi (and obviously Luke vs. Kylo doesnâ€™t count). In an effort to make this edit even MORE Star Wars-ish. The duel with the guards is now all all-out lightsaber duel and itâ€™s pretty awesome. I actually like the idea that Snoke would have his guards armed with lightsabers, being that the Jedi and Sith are a thing of the past at this point in the timeline, yet Snoke is still like a Sith fanboy. OR they could be some of Lukeâ€™s former students. PLUS, Hell, Finn even fought with a lightsaber in TFA so itâ€™s already been established you donâ€™t HAVE to be a Jedi or Sith anymore to wield a lightsaber. Anyway, it obviously took a lot of editing to the scene but I like it and if youâ€™re interested, this cut (v7) is the one to watch. Lightsabers seem to be this rare thing, I am not sure I agree with that, but in TLJ and even RotJ they seem to be rare and crafted individually by their creator. They are not created on a manufacturing line. Maybe these ones are. I do like the idea of them having lightsabers there weapons seemed a bit bizarre. Looking forward to viewing this. This is an interesting idea. I think there are decent points both for and against this idea. Like you said, it would be a cool way to have a more blatant lightsaber duel since there really isnâ€™t a traditional one in this film. Lightsabers arenâ€™t meant to be a mass-produced thing, but the lightsabers Imperial Inquistors used, like the oneâ€™s used in Rebels, were manufactured and not originally made by each Inquisitor, so it wouldnâ€™t be totally unheard of. On the other hand, the original Imperial Royal Guard used vibro-based weapons, so the weapons they use in-film are inline with that. I do think the Legends â€œShadow Royal Guardâ€� had lightsaber pikes, though. Also, the Imperial Knights from the Star Wars: Legacy comic series were styled off of the Royal Guard, and they used silver lightsaber, which also would be pretty cool to see. Anyway, I think it is a pretty cool idea to just set it apart from other TLJ edits. I imagine it was/is a lot of work though: I think some of the weaponsâ€™ blades are wider than a traditional lightsaber, and some of the blades curve, how do you handle that? What about the weapons that are lying on the ground with the blades visible? And like Dom said, you also will have to have the sabers reflect on the floor as well. The â€˜guard duelâ€™ scene really looks great and the more i watch it, the more i like the idea of the guards being former studentsâ€¦ or just Sith fanboys. v7 is rendering now. There may be a v8 if i can get the VFX work for Lukeâ€™s green saber in the kylo duel - iâ€™d love to fix that little detail as well. If i can get it, then there will be a v8 for sure. Just sent a PM. Canâ€™t wait to see what you have done. I need a â€œgo toâ€� version of this movie. I hate that I canâ€™t get through a Star Wars movie. None of the prequels did this to me. Hard to believe the most recent in the Saga messed up that bad. Looking forward to seeing your creation. v7 is out - aaaaaand thatâ€™s a wrap for this edit. Iâ€™ve watched it and this it as good as it gets for me. Hope you guys enjoy! For those who like to burn fanedits to disc like I do could someone tell me how to convert the fps from 30 fps to 23.976fps without it ending up choppy in the first 5 or so minutes? Iâ€™m adept at the conversion part as well as everything else that it takes to make an AVCHD/Blu Ray itâ€™s just this 30fps to 23.976fps thing thatâ€™s giving me problems. Hopefully ForceGhostRecon can help out a little. Thank you very much and of course for the awesome fanedit! Edit: Please make sure the frame rate is â€˜constantâ€™. I watched this edit tonight and out of all the TLJ fanedits Iâ€™ve seen I think this is my favorite. He basically cut out everything I hated about the theatrical release and made some really cool changes. The Pratorean Guards all having lightsabers is one of the most awesome fan modifications Iâ€™ve ever seen. Great work, man! Did you also add lightsabers when Snoke shocks Kylo and the guards stand on alert? I thought I cut that out in that scene but i just went back and itâ€™s still there. So there may be a v8 after all. Well on the bright side those one or two shots will be a breeze compared to all the work that went into the fight scene! Who is this VFX wizard?